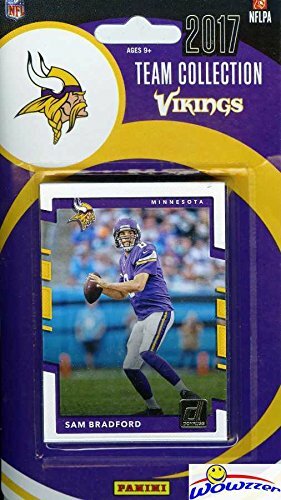 Minnesota Vikings 2017 Prestige NFL Football factory sealed 10 card team set including Sam Bradford, Latavius Murray, Kyle Rudolph, Adrian Peterson, Adam Thielen, Stefon Diggs and Jerick McKinnon plus Rookie cards of Dalvin Cook, Stacy Coley and Bucky Hodges. 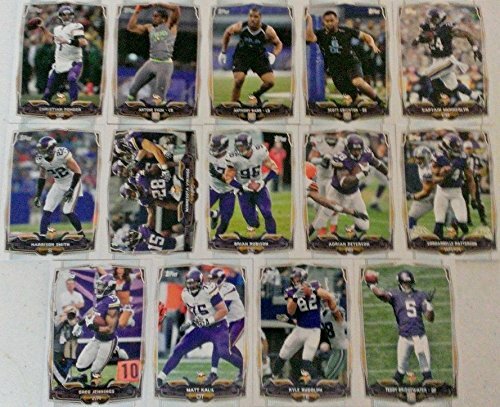 Minnesota Vikings 2017 Donruss NFL Football factory sealed 12 card team set including Randy Moss, Sam Bradford, Adam Thielen, Xavier Rhodes, Latavius Murray, Jerick McKinnon, Anthony Barr, Harrison Smith, Stefon Diggs plus Rookie cards of Dalvin Cook, Bucky Hodges and Stacy Coley. 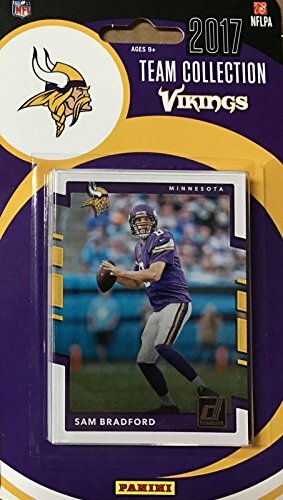 Minnesota Vikings 2015 Score factory sealed 18 card team set including Teddy Bridgewater, Matt Asiata, Jerick McKinnon, Harrison Smith, Jarius Wright, Charles Johnson, Adrian Peterson, Kyle Rudolph, Cordarrelle Patterson, Everson Griffen plus rookie cards of Danielle Hunter, DaVaris Daniels, Eric Kendricks, MyCole Pruitt, Stefon Diggs, T.J. Clemmings, Taylor Heinicke and Trae Waynes. 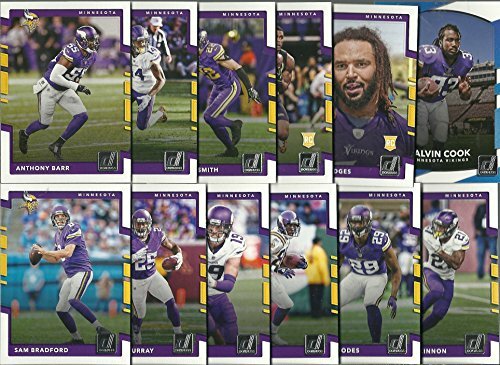 Minnesota Vikings 2017 Donruss NFL Football Factory Sealed Limited Edition 12 Card Complete Team Set with Sam Bradford, Dalvin Cook Rookie, Legend Randy Moss & More! Shipped in Bubble Mailer! Wowzzer! We are Proud to offer this Minnesota Vikings 2017 Donruss NFL Football Factory Sealed Limited Edition 12 Card Complete Team Set! 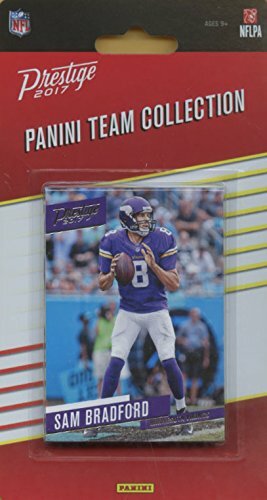 This Factory Sealed Team Set includes Sam Bradford, Legend Randy Moss, Adam Thielen, Xavier Rhodes, Latavius Murray, Jerick McKinnon, Anthony Barr, Harrison Smith, Stefon Diggs plus Rookie cards of Bucky Hodges and Stacy Coley and Rated Rookie of Dalvin Cook! This is a MUST HAVE Collectible for all fans of this NFL Team! This Team Set is a Great Way to Remember the Season! Includes all the Top Players, Legend and Rookies! Makes a Great Gift!Check out our Amazing Prices and Large Selection of Factory Sealed Boxes, Sets, and Singles of MLB, NFL, NBA, NHL, Soccer & Much More! We also have a HUGE Selection of BCW and Ultra Pro Supplies!Plus be sure to check out our Super Popular Amazing Beckett GGUM AUTHENTIC GAME USED MEMORABILIA GRADED Cards! Look for Cards of Michael Jordan, Emmitt Smith, Mickey Mantle, Lebron James, Kobe Bryant, Dan Marino, Cal Ripken, Mark McGwire, Elvis Presley & Many More!Search- BECKETT GGUM BGS to find these Great Looking Graded Game Used Memorabilia Cards! 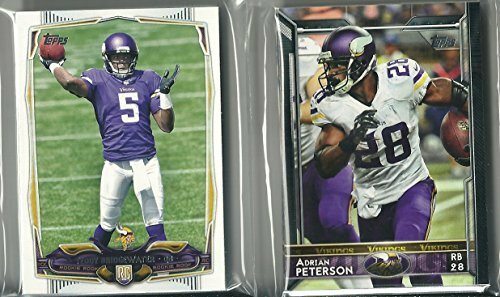 Minnesota Vikings 2015 Topps complete regular issue 16 card team set including 3 different Adrian Peterson cards (regular card #228, Topps 60 #342, Fantasy Studs #329), Teddy Bridgewater, Anthony Barr, Cordarrelle Patterson, Xavier Rhodes, Matt Asiata, Mike Wallace, Jerick McKinnon, Trae Waynes, T.J. Clemmings, Eric Kendricks, Danielle Hunter, Stefon Diggs and a Vikings Team Leaders Card. 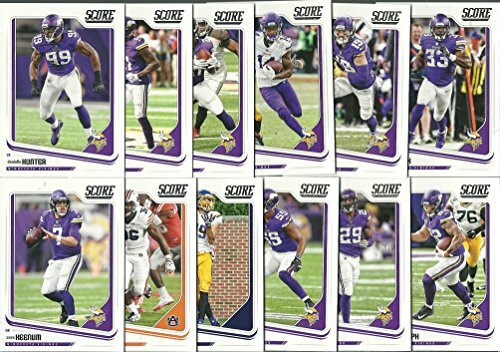 2017 Donruss FOOTBALL MINNESOTA VIKINGS TEAM SET 12 cards in set Included are: #46 Xavier Rhodes #60 Randy Moss #68 Sam Bradford #111 Adam Thielen #112 Latavius Murray #169 Jerick McKinnon #186 Anthony Barr #284 Harrison Smith #285 Stefon Diggs #343 Dalvin Cook Rated Rookie #357 Bucky Hodges RC #377 Stacy Coley RC 2016 Donruss Laquon Treadwell RC, Moritz Bohringer RC, Mackensie Alexander RC, Teddy Bridgewater, Adrian Peterson, Jerick McKinnon, Stefon Diggs, Kyle Rudolph, Anthony Barr, Everson Griffen, Harrison Smith, and Fran Tarkenton. 2014 Topps Football Minnesota Vikings Team Set In a Protective Case - 14 cards including Kyle Randolph, Captain Munnerlyn, Cordarrelle Patterson, Adrian Peterson, Brian Robison, Teddy Bridgewater RC, Matt Kalil, Harrison Smith, Christian Ponder, Greg Jennings, Scott Crichton RC, Anthony Barr RC, Antone Exum RC, and a Team Card. Looking for more Minnesota Vikings Team Set similar ideas? Try to explore these searches: Bag Rear Propelled Lawn Mower, Boned Bustier, and Lil Dude Stirrups. 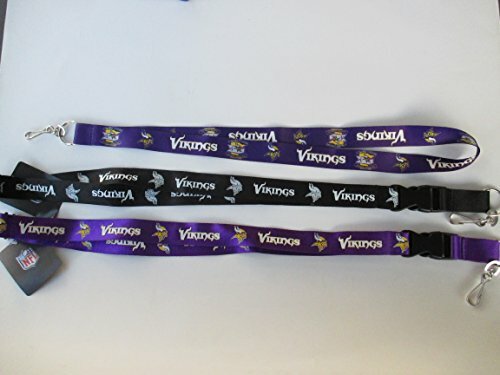 Shopwion.com is the smartest way for comparison shopping: compare prices from most trusted leading online stores for best Minnesota Vikings Team Set, Lime Sweet Sugar, Bobbin Tools, Vikings Minnesota Team Set . 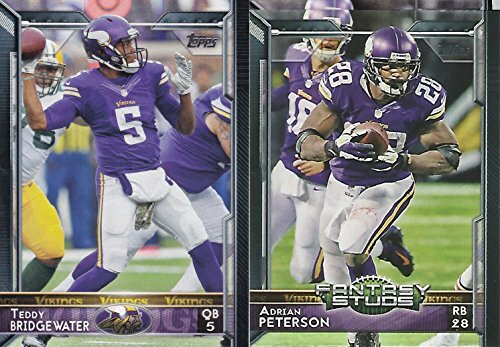 Don't miss this Minnesota Vikings Team Set today, April 21, 2019 deals, updated daily.